How Does a Massage Help to Relieve Stress and Tension? You are here: Home / Massage / How Does a Massage Help to Relieve Stress and Tension? While massage comes with a long list of benefits, many people enjoy getting one not only because it's relaxing, but because it gives them 60 to 90 minutes of "me-time." Nothing comes as close to the relief of feeling the tension and stress in our bodies and minds melt away than a deep, effective massage. There are also more serious health ailments and conditions, such as arthritis or sciatic pain that improve significantly when treated with massage. The benefits really do run the gamut. But even though we enjoy them, the vast majority of us never stop to think about how or why they actually work. Why do we feel so relaxed after a massage? How does a massage help relieve stress and tension? We set out to dig a little deeper into the science and intricacies of massage therapy to come up with some answers. The healing effects of a massage, while many, are a bit elusive. A lot of us subscribe to the if-it-ain't-broke-don't-fix-it mentality, which is to say, who cares why and how it works, it just feels good, so keep doing it. 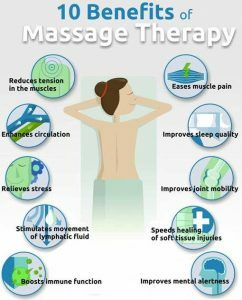 The reality is that massage has an impressive list of proven positive outcomes, both physical and emotional. One of the most common reasons people get a massage is to alleviate back pain, and for good reason. Research has shown that massage is one of the most effective treatments for chronic low back pain. It's also been proven beneficial in combatting neck and shoulder pain, inflammation and soreness related to exercise, and joint pain related to arthritis. Medical professionals at the Mayo Clinic have created an entire program dedicated to using massage to reduce tension and speed healing after cardiac surgery. Two of the greatest threats and contributors to these types of conditions and health problems in our society today are stress and tension. We undergo more stress now than in any previous generation, and it is taking a heavy toll on our bodies and minds, leading to more physical and mental illness than ever before. This is one of the reasons stress and massage benefits, among other holistic treatments such as yoga and meditation, have been gaining favor among health professionals. Massage is one of the most effective treatments we have in combatting depression, anxiety, chronic illness, and pain. One of the most effective treatments for tension is to relieve stress with massage therapy. Whether via a massage practitioner or physical therapist, using a stress ball, or purchasing one of the many advanced massage chairs available, if you're wondering how to relieve tension, massage is perhaps your greatest ally. There are many different types of massage therapies and styles. Depending on the target area or specific pain, tension, or muscle group you're addressing. You should make sure you're getting the right features and capabilities on a home device, or discussing details with your therapist to ensure you receive the most effective hands-on treatment possible. The best massages for stress relief are Swedish, Shiatsu, hot stone, and deep tissue massage, which is sometimes referred to as trigger point. These massage styles focus on applying pressure to tight muscles in order to remove and release tension. Swedish massage is probably the most common type and is the one you are most likely to receive when visiting a day spa or massage therapist. It is highly effective in treating stress and promoting relaxation. Therapists (and robotics in massage chairs) apply a deep pressure to muscle groups, which, in addition to releasing tension, also increases blood flow to the skin and muscles. Shiatsu style massage is rooted in the Japanese tradition, and similar to ancient Chinese practices, utilizes the principles and theories of acupuncture. Shiatsu follows the body's meridians and aims to release the energy blockages within them. Hot stone massage is similar to Swedish in that the focus is on applying pressure to muscles to relieve tension. In addition, via heated stones, it also aligns energy flow, which enables greater harmony throughout the body and mind. Deep tissue massage is a slower, deeper style of massage that finds areas of tightness and stress and applies prolonged, focused, intense pressure. This in turn loosens the muscles and releases inhibition. This style is usually used in concert with Swedish for a well-rounded, all-body massage that relieves tension in the body and mind. We are up against more stress and pressure in our world today than ever before in history. The resulting tension is causing health and wellness problems, which are in turn taking a toll on our bodies, wallets, and well-being. One of the most effective treatments for combating this ever-growing crisis is to take care of ourselves with healthy living. Massage should be included in that lifestyle.